Frome has several different shopping areas that feature a number of large stores and smaller, independent shops. 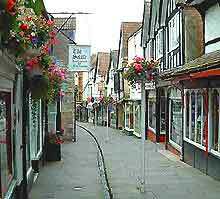 There are also numerous specialist shops in Frome, including jewellers, art galleries, craft shops, toy shops, antiques shops and gift shops. Cheap Street is one of Frome's most important and historic streets and is lined with small, interesting shops, including cafés, bakeries, gift shops, craft shops, jewellers and a newsagents. The Westway Precinct is situated in the heart of the town centre and is connected to the Market Yard by a modern, steel bridge. There are a number of shops in this area, and these include a newsagents, bakeries, shoe shops, an art gallery, fruit shops, a large toy shop, gift shops, a hardware store and travel agents. Other shops of interest include Argos, WHSmith and a Somerfield supermarket. The Market Place is located in the centre of the town and features several large shops, such as Boots, M&S and all of the major banks are well represented. Other shops of interest in Frome's Market Place are a bicycle shop, where bicycle rental is available, card shops and an electrical store. 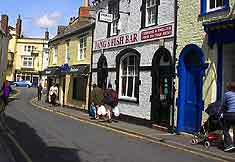 The King Street area of Frome has a number of small and interesting shops, including two excellent fish and chip shops, the Frome Pet and Aquatic Store and a large supermarket. 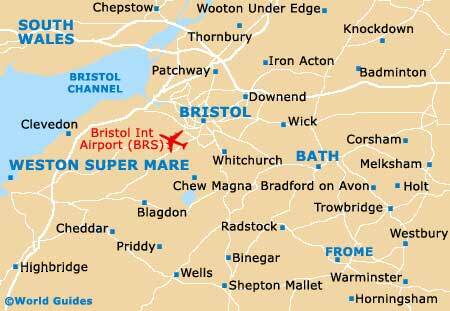 There are a number of large stores located outside of Frome's town centre and these include DIY Stores, large supermarkets, garden centres, garages and fastfood outlets. Visit World Guides to Bristol for further information about Bristol Shopping. Visit World Guides to Bath for further information about Bath Shopping.